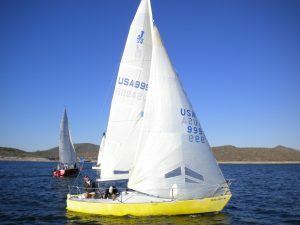 This boat is a classic 25′ symmetrical spinnaker racer. The AYC Merit Fleet includes over a dozen boats in Arizona imported from all over the country. Boasting a speedy PHRF rating of 168, these sleek fiberglass racers offer a roomy cabin with full sitting headroom, a 7.5’ V-berth, two additional cabin berths 7’ long, and a Lexan foredeck hatch. Contact Steve Kusic for additional Merit 25 Fleet information, especially if you know of additional Merit 25’s available in the region.